If you miss the days of plastic cups and parties in the backyard, then it's time to revisit them with the Red & Blue Reusable Hard Plastic Cup Set from Fairly Odd Novelties! This set of 4 cups looks exactly like the ones you remember from childhood barbecues and cookouts, as well as college frat parties, only now they're made of hard plastic so they can be used over and over! Get ready to "throwback" your next drink in style! If you miss the days of plastic cups and parties in the backyard, then it's time to revisit them with the Red & Blue Reusable Hard Plastic Cup Set from Fairly Odd Novelties! 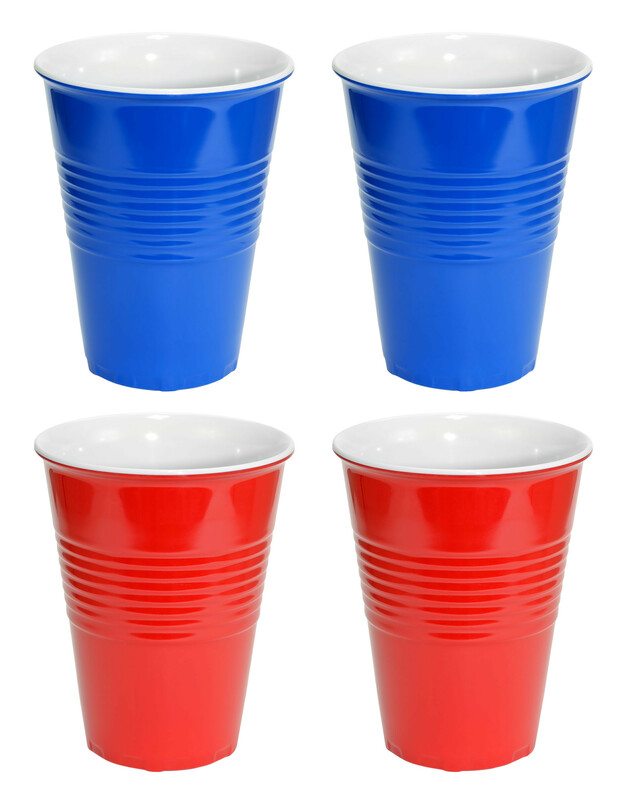 This set of 4 cups looks exactly like the ones you remember from childhood barbecues and cookouts, as well as college frat parties, only now they're made of hard plastic so they can be used over and over! Whether you're having a cookout or barbecue in your backyard or going to your local field after dark for a bit of a party, these cups make everything a little easier, and keep you from wasting money on huge sets of easily broken plastic cups! This set of cups is perfect for enjoying your favorite beer, wine, soda, juice, or cocktail, and is made to be enjoyed solo or with friends. Order now and bring a bit of nostalgia to your next drink! Pair with our White Reusable Hard Plastic Plates for a perfect throwback barbecue set! Cups are red and blue plastic and hold up to 20 US fluid ounces. Set includes 4 cups, with 2 of each color. Cups have a 3.75" circumference and are 4.75" tall. Dishwasher safe, DO NOT MICROWAVE!